Miss Russia is the honorary title, which is the dream of many girls and young women. It is a recognition not only of female attractiveness, but also charm, charisma, uniqueness, ability to please people, and create an excellent impression. To the competition Miss Russia participants have been prepared for a long time, they lead an active lifestyle, carefully take care of themselves, to maintain a good physical condition. And the girls learn the secrets of the world of fashion models, because they need to be beautifully and gracefully move across the stage, in front of the jury and the audience, to present themselves, their costumes. Not least important is the ability to competently and confidently speak, to communicate with others, to answer the questions of the jury or the spectators. As you can see, Miss Russia contest participants pose in front of a lot of problems to solve some they even need professional help. 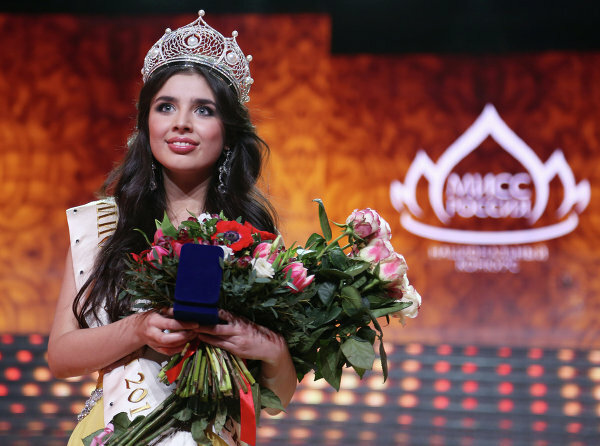 Only the winner of Miss Russia cope with all the challenges and tasks at the highest level, and therefore deservedly receives this coveted title. She will testify about the beauty of the girl, and her fine personal qualities. The competition has been held for a long time. And throughout the years, participants of the contest Miss Russia were from the most different regions of the country. These were the women not only from big cities, many came from even the most remote and small settlements. Place of birth and life, working of member has no value if she can delight others with her beauty, rich inner world, intelligence. Do not be skeptical of that statement, that the winner of Miss Russia - is intelligent and educated beauty. External girls beauty will not shine brightly when her soul, the inner world are empty and uninteresting. Contestants of Miss Russia demonstrate how diverse and rich world of female beauty. On the vast area of the country inhabited by a girl with a very different type of appearance, and at the competition you can see blue-eyed blondes, representatives of Slavic appearance, and black-eyed brunettes and redheads girls. They are all beautiful in their own way, unique, they deserve only admiration. Especially when you consider that almost all the beauty, claiming the title of Miss Russia, and still have time to get a higher education or build a successful career. Every year the competition Miss Russia opens new names, it is the most beautiful and interesting women of the country. Competition shows that Russia is the country of real beauty, delicate, bold, smart and loyal. Those who receives the honorary title, with responsibility pertains to win, becoming the member of various charitable and social, of social movements. Winning the competition becomes for them a further incentive to move towards perfection. София Никитчук - очаровательная модель, которая в 2015 году сумела выиграть конкурс «Мисс Россия-2015». Родилась София Никитчук 20 октября 1993 года в Челябинской области, в городе Снежинск. София будет представлять нашу страну на конкурсе Мисс Мира 2015. Yulia Alipova - родилась в 1991 году в городе Балаково Саратовской области. Elmira Abdrazakova победительница конкурса Мисс Россия 2013, родилась в Междуреченске Кемеровской области. Elizaveta Golovanova родилась в 2 апреля 1993 года в г.Сафоново, Смоленская область в семье медиков. Natalia Gantimurova род. 14 августа 1991 года в г.Пласт Челябинской области. Irina Antonenko род. 1 сентября 1991 года в Екатеринбурге в семье работников милиции. Sofia Rudieva род. 15 ноября 1990 года в Ленинграде в семье художников. Ksenia Sukhinova род. 26 августа 1987 года в г. Нижневартовск, где провела своё детство. Tatyana Kotova род. 3 сентября 1985 года в посёлке Шолоховский Ростовской области. Alexandra Ivanovskaya род. в 1989 году в Комсомольске-на-Амуре. Diana Zaripova род. в Набережных Челнах в 1985 году. Уже в 12 лет стала фотомоделью,. Victoria Lopireva род. 26 июля 1983 года в Ростове-на-Дону. Svetlana Koroleva род. 12 февраля 1983 года. Oksana Fedorova род. 17 декабря 1977 года в Пскове, где и жила до 18 лет.